Fragrance in the garden is sought after, some gardens are designed around fragrant plants, a walk through them is a sensory delight. With our list of fragrant plants we can all add a little perfumed magic to our gardens, and many fragrant plants can also be grown in containers. You do need to be a little wary when choosing plants that are highly perfumed, some can be a little overpowering. Careful placement is the key to creating a fragrant garden. 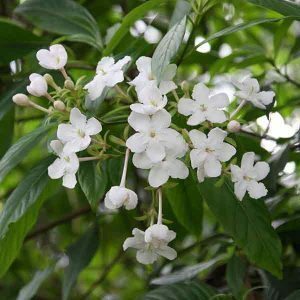 When we think of fragrant plants and flowers for the garden the sweet scented perfume of plants such as roses, Daphne and the scented pelargoniums come to mind, however the list is much longer and varied than this. Some fragrant plants have fragrant flowers and some fragrant leaves. And while the range of fragrant or perfumed plants is huge in terms of species, the variety of fragrances from citrus through to chocolate is amazing. Fragrant or perfumed plants need to be carefully positioned some require to be close to a path to have any effect, other with strong fragrances may need to be planted away from the house. Trees such as citrus, many of the magnolia and prunus can be included as fragrant plants as can bulbs such as hyacinth and Grape Hyacinth, climbing plants such as Jasmine and Wisteria along with perennials including Peony and Lily of the Valley. And of course, fragrant herbs. Some plants release fragrance at night such as Mandaevillia and Erysimum. ‘The Night Scented Jessamine’ or Cestrum nocturnum’ is one that is easy to grow, however for versatility, strong fragrance and great flowers as well we do like the Night Blooming Cerus or Epiphyllum Oxypetalum, also known as ‘Dutchman’s Pipe’.